Ivybridge fathers' rights campaigner Jolly Stanesby has protested on the rocks of Stonehenge dressed as Fred Flintstone.The 41-year-old and two colleagues, also dressed as the cartoon character, from the Fathers 4 Justice group climbed on to the ancient monument in Wiltshire at about 9am with supplies to last three days. They said they were demonstrating against comments about absent fathers made by Tory leader David Cameron.Matt O'Connor, founder of the group, said the protest was in response to Mr Cameron's 'failure to get to grips with the issue of absent fathers in Britain. 'Mr Cameron said yesterday that attitudes to gun-carrying and absentee fathers had to be altered in the same way attitudes to drink-driving had changed. Mr O'Connor said: "Mr Cameron says fathers are abandoning their children and this can lead to children getting involved with crime. We at Fathers 4 Justice feel very strongly that this is not always the case. Mr Stanesby has only just been told he will not be prosecuted for a rooftop protest dressed as Father Christmas at a judge's house near Exeter in November.But he is also accused of chaining himself to former children's minister Margaret Hodge. Mrs Hodge was stuck in the cuffs for about 40 minutes outside the Lowry Hotel in Manchester, where she was attending a conference on November 19, 2004. Stanesby denies false imprisonment and faces trial in May. Three Fred Flintstone campaigners from Fathers 4 Justice scaled Stonehenge at 9.15am this morning in anger at David Cameron's comments about absent fathers this morning. Jolly Stanesby, 36, from Ivybridge Devon, Dave White, 29 from Southampton and Richard West, 40, from Ottery St Mary, Devon are all wearing Fred Flintstone outfits in a symbolic protest at what they say is Caveman Cameron's naive and prejudiced beliefs about fathers when 300,000 dads have lost contact with their kids in the family courts since 1997. Cameron had said fathers are abandoning their children. The protestors evaded tight security and prevented English Heritage officers forcibly removing them from the stones with a ladder. Said F4J Founder Matt OConnor, We need an urgent, intellectual debate about fatherlessness, not meandering Neanderthal comments from dinosaur Dave. Stonehenge is symbolic because it formed the foundation of our society, foundations being eroded by all the main political parties. Family Law is literally killing kids stone dead. Family breakdown is rife and last weeks Unicef report put Britain bottom out of 21 countries as being the worst place in the first world to grow up. We want to consign the secret family courts to history and by putting the world's most famous stone age man on top of the world¹s most famous stones, we aim to show our commitment to our nations children. No charges are to be brought against a Fathers 4 Justice campaigner who staged a protest on the roof of a Devon judge's house, sparking a massive police operation costing many thousands of pounds.Police have also revealed that no action will be taken against the judge after claims that he pointed a loaded shotgun at Jolly Stanesby as he perched on his roof. 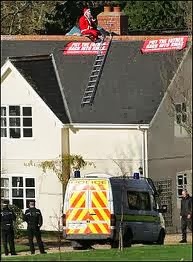 Around 80 police officers were deployed when the two-day protest began in November, but police have declined to put a figure on the cost of the operation.Mr Stanesby, 37, a registered childminder from Ivybridge, was arrested after spending two days dressed as Father Christmas on the roof of Judge David Tyzack's Glebe Lodge home. At 6.30am on November 28, he roped himself to a chimney and set up a rooftop camp.Police cordoned off the area, monitored him round the clock for two days and tried to persuade him to come down.Judge Tyzack QC, who sits at Exeter and Plymouth County Courts on family cases, was targeted for the protest because his rulings on access to children had incensed Fathers 4 Justice supporters. A statement made on behalf of Judge Tyzack at the time said he took the shotgun out because he thought there was a trapped or wounded bird on the roof.Decisions to take no further action in both cases were taken by the Crown Prosecution Service. Despite not facing charges himself in relation to the incident, Mr Stanesby told the Echo yesterday: "I am not very happy about no action being taken against the judge. "The judge just wants to keep it quiet and drop my charges as well. "My intention for the protest was to get heard. "He said he wanted fathers to be treated equally in matters of family law and he would not be giving up. Mr Stanesby claimed to have received overwhelming support for the protest. "It works and it is our only way to get our voices heard," he said.Fathers 4 Justice says that it will be challenging the decision not to charge Judge Tyzack and may pursue a civil case. The group remains indignant that the Government refuses to hold any discussions with it.In a letter from Harriet Harman to Mark Oaten, MP of Fathers 4 Justice founder Matt O'Connor, she ruled out the prospect of any meeting.Mr O'Connor said: "At least we can say we tried. I look on the letter as a formal invitation to us to resume our activities. "When we are ready we'll give our response in the time-honoured tradition. I don't expect they'll have to wait too long. "A Fathers' Day demo is planned by the group in London on June 15.